Citric Acid, Natural & Artificial Flavor, Sucralose, Acesulfame-potassium, FD&C Yellow #5, FD&C Red #40. Citric Acid, Natural Flavoring, Sucralose, Acesulfame-Potassium, FD&C Yellow #5. See our iForce SwoleMate review on YouTube and read our iForce SwoleMate blog post! 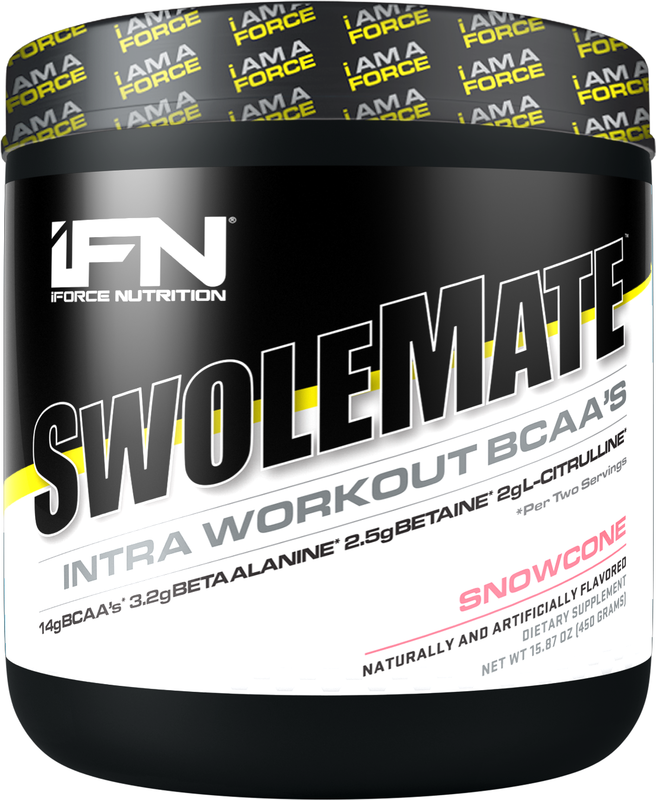 iForce SwoleMate is here! Never lift alone again! Intra Workout With 14 Grams Of BCAA's, 3.2 Grams Beta-Alanine, 2.5 Grams Of Betaine & 2 Grams Of L-Citrulline! Promotes Endurance Muscle Pumps & Recovery For During And After Workouts! iForce Nutrition has completely unveiled its upcoming intra-workout amino formula SwoleMate, which has had a number of previews and teasers released over the past couple of weeks. Every one of the supplement's ingredients has now been confirmed, as well as its flavors and size. 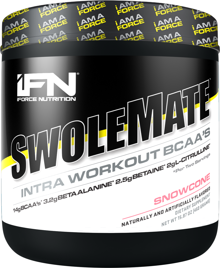 The intentions behind iForce's new SwoleMate are somewhat straightforward, much like its combination of ingredients. It packs a fully transparent formula to help increase muscle pumps, build muscle, improve recovery and hydration, and enhance performance and endurance. When it comes to SwoleMate's formula, as mentioned it features a fairly simple mix of common workout ingredients. The biggest feature in the product is its BCAAs which are dosed at a heavy 7g per serving, and at the usual ratio of 2:1:1. The remaining ingredients in SwoleMate are 1.6g of beta alanine, 1.25g of betaine anhydrous, a gram of citrulline, and a handful of electrolytes to help with hydration. You may notice that on the front of SwoleMate it does promote doses twice the amount of what's listed above, which is because that is based on taking two servings. It is of course entirely up to you how much you use, although if you take two to get the doses closer to their more clinical amounts such as 3.2g of beta-alanine, you will only get 15 servings as the supplement has 30 per tub. As for when you'll be able to get your hands on iForce's new intra-workout competitor, production of SwoleMate has finished just this week. From there it is expected to then hit stores sometime between now and the end of next month. Those interested in purchasing the product can look forward to getting it in three 30 serving flavors with Rocket Pop, Snowcone, and Sour Lemon Candy.